Today is long over due, and I have been meaning to get this out there for at least a month now, but as they say “life gets in the way sometimes”. 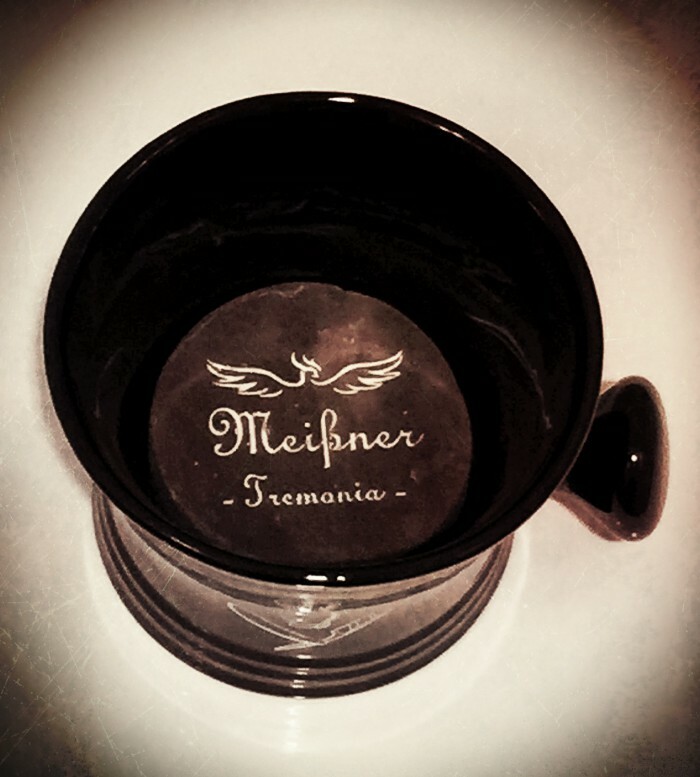 I’m really excited to talk about today’s soap as it is the “Other” Meißner Tremonia soap I have used. I had stated in my review of “Dark Lime” from Meißner Tremonia; I felt each of their soaps had a specific skin type in mind when they were made. I also complimented German products as some of the most stringently controlled and tested products in the world, be it a car, boiler, or shaving soap I do not feel they cut any corners. So lets get to it, and talk about some suds ! Packaging – As with the other offerings from Meißner Tremonia I felt like I was more opening a box that would contain jewelry or, some other precious item. The packaging was for a refill that as you can see in the photo above, is encapsulating the soap in a foam protective form fitted case. The actual box is like I said nothing to say lightly, this is thick; not your typical thin refill box. The label is fairly basic in design but says a lot… it is that German minimalist thing, less is more and the box, basically says Finest Shaving soap with Scotch Whisky and Wool Fat. Keep that in mind down this review a bit. The back also lists a very different ingredient list than “Dark Lime”, again I believe each soap is intended for a specific skin type. We will get to that in a moment. So as far as packaging goes; don’t throw these out, I can think of many things worthy of the protection these boxes can be used for or, recycle them. Either way we are off to a good start ! Scent- This is a very love it or, hate it scent I will not sugar coat that. This is where that back label starts to tell us a lot about what to expect for the scent. The third ingredient is Whiskey ! the other two before it are just an oil and a hardening agent stearic acid as well as both NaOh & KOH salts to make this a shaving soap. Further down the list, but more potent in aroma you see types of wood like Cedar wood, and Juniper wood tar and Lanolin ! These all play a role in the scent you will experience. I would describe this a believe it or, not “like” a smoker used in smoking barbecue ! Similar to a southern pit that is smoke, wood, and most of all whisky ! instantly I was thrown back as I expected to smell only Scotch Whiskey, and that just is not the case. So in this department, I have to say if you were to blind buy this you may be saying “what the heck did I just get”. Please do not think I am saying it is a bad aroma, actually, I am saying it is way more complex then just whiskey….this is a smokey, woodsy, and whiskey scented soap where these scents blend wonderfully to create what most whiskey lovers would probably find to make a very fine libation. Do not drink this soap……I promise a different result from actual whiskey will ensue. Lather- Again different soaps for different skin types and this is evident again by simply reading the back label ! The lather is absolutely on par with some of the best soaps I have used. If I was to compare it to it’s same brand “Dark Lime” I would describe the two as complete opposites, “Dark Lime” was wonderful so don’t misinterpret my words, but “Strong ‘N Scottish” was more my type of lather ! Cushioning is an understatement, easily no matter what brush or, water type I threw at this soap it was fairly consistent; Thick, Creamy, and aromatic with the scents mentioned above staying with the lather throughout the shave. Also worthy of mention is the reddish tint to the lather, which is mild and easily seen while making the lather as a result no doubt to the red clay they use (again on the label) I found it unique. Post shave this lather left my face super soft due to the lanolin that is in this specifics soaps formulation. I believe we are all starting to see with this brand each soap is formulated differently, where as “Dark Lime” is great for oily skin, “Strong ‘N Scottish” is meant to leave your face fully moisturized. It does however omit the Shea butter that is in other offerings. Just my opinion, but I’ll take Lanolin any day. Slickness/Glide- What can I say here….. it is fairly straight forward. I would have to say aside from Scent, this is the only other place YMMV. For me as a primarily straight razor shaver, Glide is without a doubt your number one concern. 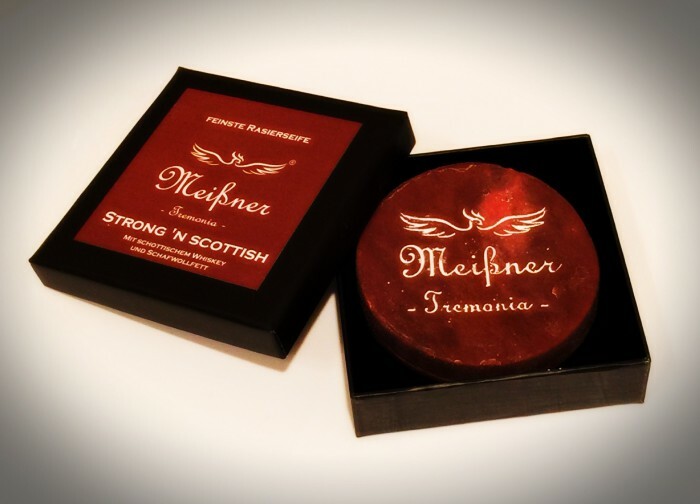 Meißner Tremonia has done an adequate job creating a slick soap…I can’t really say much more, except, make your lather properly ! Too much water or, too hot of water will make this a thinned out mess that is rendered sub- par, not enough water, and you will have an airy and again sub-par lather with little to no slickness. I always recommend start drier, and add water to your desired consistency. 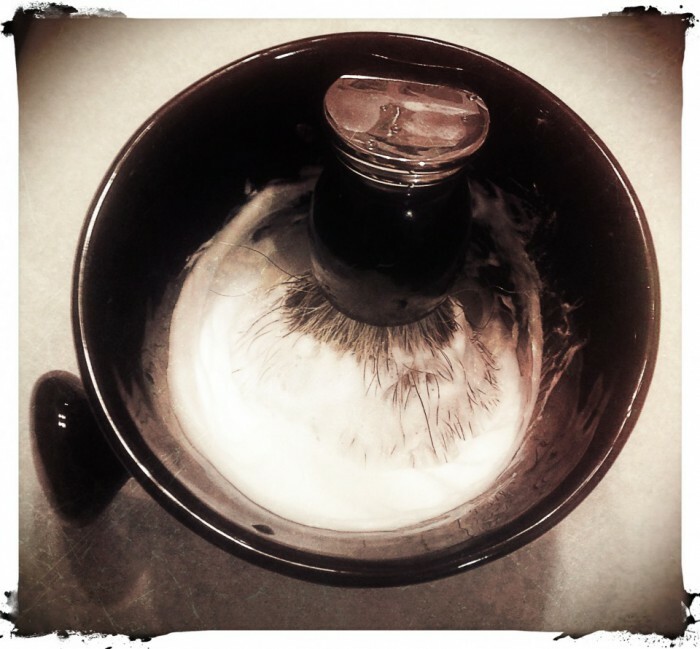 With a DE or SE razor….I would think you would get great results fairly fast, and without much thought. I am not a DE shaver nor, do I put little thought into shaving with a straight razor held to my neck ! I make sure the lather is slick as can be, and this soap absolutely delivers ! 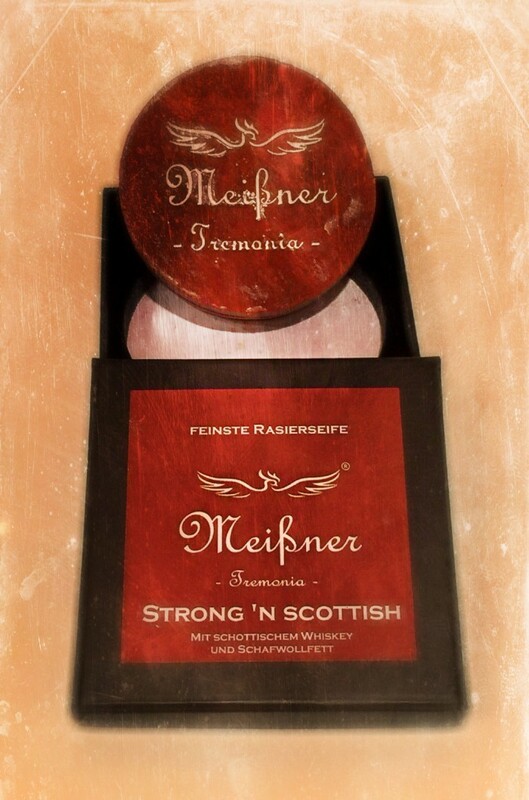 Just take your time to “learn” the soaps nuances, once you dial it in there are few soaps that I find commercially that will come close to Meißner Tremonia “Strong ‘N Scottish”. In Conclusion- No matter how slick or great a soap performs, you need to enjoy using it; on the most basic of level. That most basic level are two things “Do you like how it smells” you don’t want to gag through your shave, and “Does the lather hold up” no razor burn ! So based on this, same as with other offerings by literally every soap maker, there is a place in someone’s den for a Smokey Woodsy and Whiskey soap ! I would personally find this a great winter or fall fragrance as it just feels like that to me. Many could argue it reminds them of barbecue, and they would be 100% correct. Scent is subjective and to my senses I found this soap to meet the mark that I would say it’s worth a try, but remember the dominant notes ! this is not a mint julep ! Secondly the lather, as said above and again every soap has its own ways, and this is no exception. I found this soap when started a bit drier and worked into a rich & creamy lather with tons of glide was simple ! 2-3 minutes and I was on my way to a BBS shave ! My last thoughts to convey are pairings being this is such a unique blend of scents is what to use for an aftershave. Well you have a few options. My first reaction is to make sure you know Meißner Tremonia makes after shave splashes and lotions. They unfortunately do not say “Strong ‘N Scottish” or, “Dark Lime” though what they do offer will compliment their entire range of soaps as all the after shaves have a wood note combined with beer or, wine etc. or, even a unscented version. I am a fan of unscented with this particular soap as its just that unique. If you wanted to get adventurous a fine musk or, even a Bourbon infused bay rum will work well with this….Just don’t rub Scotch whiskey on yourself….. try explaining that to the police ! Would I recommend this- YES , but please judge the soap against itself not it’s name as this is a very complex soap with way more than whiskey in its vein. What a superb, comprehensive, review. How about an Oud fragrance afterwards?